Finishing in denim can refer to the finishing of the denim cloth, and also the finishing of the final garment once it has been sewn. Finishing the denim cloth (before it gets cut and sewn), refers to a variety of treatments applied to the fabric after it has been woven. With denim, finishing is usually fairly simple. The cloth is brushed to remove loose threads and lint, and the denim is usually skewed in a way that will prevent it from twisting when it is made into clothing. Finishing the final garment after it has been cut and sewn can involve a variety of treatments that often give the denim is final look and character. These are either hand-applied or chemically created in a wash. Any type of manual finishes are naturally more expensive as they must be applied garment by garment, whereas a wash is done by the load. A common wash treatment is an enzyme wash, which originally developed as a more environmentally-friendly alternative to stone washing. Enzyme washing uses cellulase enzymes to “eat away” at the exposed cellulose, loosening some of the indigo dye particles and giving the denim a worn, aged look. 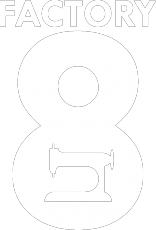 Since this is done by the load the effect is uniform throughout the entire garment. Sandblasting is a common—and controversial—manual application that will create a targeted, distressed look on selected areas of the garment. 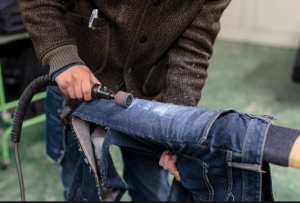 Sandblasting requires just a hose, an air compressor and sand–workers literally blast the jeans with sand, to give them a worn look and to soften the denim. If inhaled, the silica dust can cause severe respiratory problems for workers, even resulting in fatal diseases such silicosis and lung cancer in cases of intense or long-term exposure, which has led several countries and many brands to ban its use. There are alternatives to sandblasting, such as using lasers, or scraping by hand or machine, which result in a similar effect. However, these other techniques used to distress denim (such as hand-sanding, stone-washing, and various chemical treatments), all involve their own risks as well. So it is easy to see how the denim garment final finishing process is complex enough that it 1.) could affect the final fit and pattern, and 2.) could be responsible for as much as a third of the final labor portion of the manufacturing cost.